With Phoenix being 11 ½ and not getting any younger I constantly find myself worrying about every little thing he does that is out of the usual. He is quite healthy for his age, only a bit of mild arthritis and pee pee accidents when he gets overly excited, but nothing more than that. But, I still find my mind wandering when I lay in bed trying to sleep wondering if I can handle the day he needs to cross over that Rainbow Bridge. I have had Phoenix for almost 10 years now and he is really my first pet which I raised on my own. 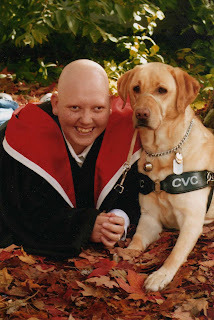 I got him as a dog guide on July 23, 1998 at 10:00am and even though I had had a dog guide for a short time before him I fell in love with Phoenix right away. 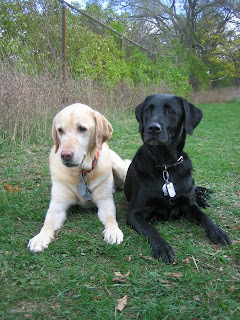 My first dog guide and I really never truly bonded, but Phoenix and I were inseparable after the second week of class. He was quite attached to his trainer when I first received him, but after two weeks of being together he became my yellow shadow and has never let me down since. We had a great working life together, but after 7 years of a fast paced life he decided it was time for him to retire and become a pet. He decided you ask…yes, Phoenix decided to retire, he began to walk slow and do things out of the ordinary like become distracted or sniff uncontrollably. After 3 months of this I decided to ask the school to come out and tell me if I am doing something wrong or if he just isn’t interested in working anymore. After only 5 minutes of walking with us the trainer told me it was my choice, that there was nothing wrong with his guiding other than he was slow and that he seemed to have no health issues, but that they felt he would completely stop within 6 months. I asked when the next class was and was told to call and see what spots were available. I called when I got home and was informed that there was a class beginning in just over a week and that I was welcome to come in. Being a person who needs to make a decision and act before thinking too much, I agreed to come in and that is when I got Cessna. We weren’t sure how well Phoenix would take to Cessna coming into our home and taking over some of my attention that would have usually been devoted to him, but he came to meet Cessna every Sunday I was in class and they have become the greatest buddies. Phoenix has now been retired for almost 3 years and is enjoying his time as a pet a lot. He will sometimes want to come along, but most times he will run back to the couch once I take down the harness, but the odd time he will shove Cessna and put it on himself…which makes me sad. To get him back into semi-public life, but not as a dog guide, we have put him into the St. John’s Ambulance Therapy Dog Program. He along with Cessna goes to visit with residents of a long-term care home about once a week. Cessna is not as keen on the visits as Phoenix, but she does have her favourites. Phoenix will sit in front of the residents and let them pet him for as long as they want, sometimes even settling down on the floor in front for a rest. When I sit alone with Phoenix by my side thinking about the past and thinking about what is to come, I still get tears. I know he has had a long and wonderful life, but I don’t know how life would be without my stubborn, deviant minded little buddy. He will do things to make you angry and when you get upset with him he will just wag his tail and laugh in his own way. He knows he is loved and knows who is boss, but still has to test the waters every once in a while. My husband, Huib, and Phoenix still fight over who’s boss, but in the end Phoenix tells him that it is me and then him followed by Huib. That was such a good post, and a good reminder that even when we think our dogs/pets are gone, they’re still really here with us. Wow, having a dog named Phoenix and a dog named Cessna. Both dogs relate to flight and motion. How cool is that! What an excellent post! That poem is wonderful! Phoenix sound like a wonderfull boy as does Cessna. Keep up the great posts.